How did people respond to the refugee crisis on social media? How are people made into migrants? Welcome to the project website for Conflict, Memory and Displacement, a research project about responses to global conflict and the consequences of global conflict in the UK and Italy. The project explored how people in the UK and Italy make sense of international conflict and how this understanding shapes attitudes to those displaced by conflict. We examined the representation of conflict and of the impact of conflict through media representations, official and popular discourses, and institutional and citizen initiatives. • how people in the UK and Italy use mainstream and social media to inform their understanding of conflicts, displacement and the role of political institutions, and how these understandings shape attitudes to displaced people. • how displaced people memorialise conflict from afar and what impact have their processes of remembering had on understandings of global conflict. • how creative methods can be used to articulate alternative accounts of conflicts, the asylum process and the role of political institutions. The creation of an online exhibition and theatrical script created in collaboration with people displaced by conflict.See here for more information about the methods we used. See here for the key findings of the research. The project is funded by an AHRC Innovation Award, connected to the PACCS Conflict Theme, Award reference AH/N008200/1. The mainstream media only covers some of the conflicts in the world. according to the situation, including the involvement of “our troops” on the ground, the kidnapping or killing of fellow citizens, the impact on “our national security”, “our economy”, “our access to natural/energy resources”, etc. In recent years conflicts, and in particular in Syria, have been represented as of interest to Western audiences because they result in “mass migrations” towards Europe, producing the so-called “refugee crisis”. coverage of the Iraq war returns to the allegedly flawed character of Tony Blair and his personal responsibility for the military intervention. A similar interpretation occurs also in the coverage of Libya, in relation to his rapidly changing relations with the country and its former leader Gaddafi In Italy. This focus on the flawed personalities of “great men” overshadows any other deeper explanation of ongoing wars. contemporary conflicts and the management of human displacement. In addition, asylum seekers and refugees feel that UK and Italian populations know little about their countries, in general, and about the histories of Empire in particular. They also argue that this absence of knowledge hampers their understanding of the causes of contemporary migration and also reinforces the sense of Western entitlement. and in Italy young people expressed suspicion of the media and its “hidden agendas”, due to media ownership, and/or political interference. In Italy, the suspicion extends to online content, because of the perceived widespread of “fake news” and the fear of manipulative practices such as clickbait. In general, people chose to consult a range of news in order to piece together accounts that could be verified by multiple sources. In the UK, people use alternative media to ‘check’ international news, especially from countries that they know or to which they are connected. mainstream media coverage framed European and British foreign aid as supporting corrupt regimes and as conning the British taxpayer. In the Italian mainstream media, the main targets of criticism are EU institutions, who are accused of “leaving Italy alone” in face of unprecedented number of arrivals by sea. intolerant. In Italy, critical attitudes to the EU are also present in comments on some Italian Facebook groups of NGOs providing reception to asylum seekers or supporting the establishment of “humanitarian corridors” from Lebanon open to Syrian refugees. In the UK and in Italy, for those with strong anti-immigration views, this radical distrust can be filtered through a conspiratorial frame in which immigrants, particularly from Muslim countries, are seen to threaten social cohesion and governments who let them in as either deliberately or unwittingly facilitating social breakdown. 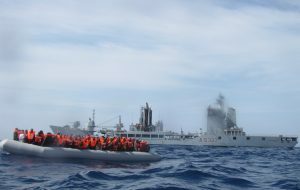 In Italy, popular distrust has extended to NGOs engaged in search and rescue operations in the Central Mediterranean, as a result of a large media and political campaign (a viral video, posted on YouTube and Facebook by a blogger attacking the “big business” of rescuing and welcoming migrants, has been taken as a case study for this trend). process demand that people present themselves as ‘deserving victims’ and that they share stories of personal pain. Migrants recognise this but also question the benefits to them of repeatedly retelling their stories to every audience – and migrants are concerned about what will be done with their stories (including by researchers). 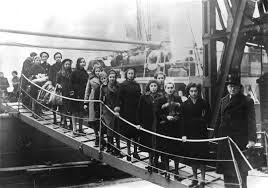 misunderstandings of asylum as legally due only to “people coming from countries at war”, thus contesting the legitimacy of those people coming from countries depicted as “safe” or “not at war”, but who were experiencing persecution. individuals. In Italy, within much public criticism of the excessively high costs of reception has led to the passing of a new law (March 2017) introducing “voluntary social activities” for asylum seekers as a way to “compensate” local communities for receiving them. and even being a “model immigrant” is no protection against this. However, although many respondents spoke of facing racism on the grounds of how they looked, they also described additional or distinct experiences as a result of their immigration status. In our initial view, the processes of migrantification and racialisation reinforce each other at key moments, but remain distinct. important resources in challenging injustice and dehumanisation. These resources both undo migrantification, by forwarding different ways of being, and provide a politicised critique of Eurocentrism and the limited knowledge within Western society of other parts of the world. Migration has high visibility in the media and in the associated public debate, despite this, there are many aspects of migrant experience rarely narrated in the news. Speak Back will focus, in particular, on media narratives that shape attitudes that perceive immigrants or migrant bodies as somehow ‘illegal’. The project brings together the research team, Implicated Theatre, and artists, alongside migrant rights organisations in Birmingham, Nottingham and London, to reflect on and critique concepts of citizenship and non-citizenship, seeking ways to transform attitudes and actions. Based on the lived experiences of members of Implicated Theatre, the Women’s Cultural Forum and Birmingham Asylum and Refugee Association, a series of public performances will challenge the news headlines, media narratives and their ‘facts’ on immigration. They will offer viewpoints and stories showing seldom-seen or heard realities of immigration and its control, presenting migration with a complexity that often has no place in the media agenda. The research team and Implicated Theatre will be working with The Women’s Cultural Forum, Nottingham and the Birmingham Asylum and Refugee Association, Birmingham. The events are free with no booking required. Does it take a tragedy to question the normalisation of anti-immigrant rhetoric? On Thursday, the 16th of June, Jo Cox, MP for Batley and Spen (West Yorkshire), was murdered in front of her constituency office in Birstall, Yorkshire by Thomas Mair, a man with links to the far right in the US and South Africa, who shouted ‘put Britain first’ repeatedly as he shot and stabbed her, and then when asked to give his name in court, said ‘death to traitors, freedom for Britain’. A day earlier, the Leave.EU campaign (fronted by UKIP’s Nigel Farage) produced a campaign poster showing a group of refugees, with mostly black and brown faces, walking down a road with a slogan reading “BREAKING POINT”. The poster (which exists in a very long line of dehumanising representations of racialized people as a threatening mass) was compared to Nazi propaganda. ‘Farage isn’t responsible for Jo Cox’s murder. And nor is the Leave campaign. But they are responsible for the manner in which they have pressed their argument’. He also said in the same article that ‘when you shout BREAKING POINT over and over again, you don’t get to be surprised when someone breaks’. PM David Cameron accused the Leave campaign of stoking intolerance and division with their immigration obsession. This is ironic considering only a year ago he referred to refugees a ‘swarm’, and only several months earlier suggested that Mayor of London Sadiq Khan was sympathetic to terrorism, provoking accusations of racism. Those moments of questioning are a tiny crack in an anti-immigrant consensus. But what will it take for these cracks to be opened wider? Our research project was inspired by a similar moment when Alan Kurdi’s body washed up on the beach in Turkey in the summer of 2015, even the normally xenophobic Daily Mail. 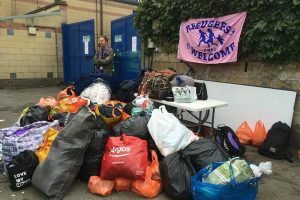 Within the UK and in other European countries, the public mood seemed to change overnight and citizen initiatives sprang up to welcome refugees, and send donations to Calais and elsewhere. This did not last and attitudes hardened again in the months that followed. And here we are today. So does it ultimately take a tragedy such as the murder of Jo Cox – like the image of Alan Kurdi’s body washed up on the beach in the summer of 2015 – to make us question the normalisation of anti-immigration politics? And how serious will we commit to this questioning: is it enough to simply call, rhetorically for a kinder, gentler politics and go back to the business-as-usual of pandering to fear and division to win votes? In a world of short-term news cycles and short-term thinking we will quickly forget (the way that Cameron might have assumed, when he called for tolerance, that not so long ago he had promoted intolerance)? 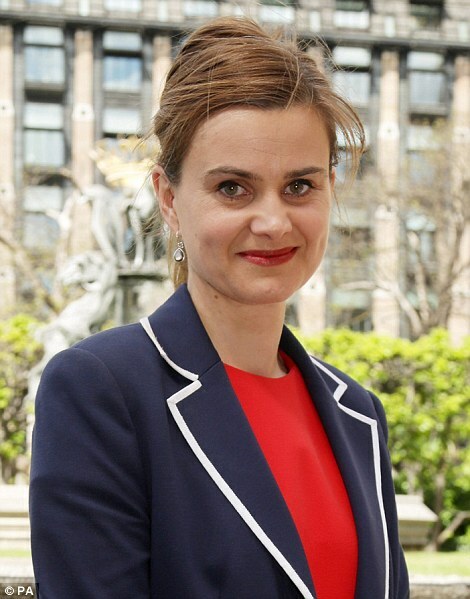 Shortly after Jo Cox’s murder, another MP, Yvette Cooper, received a death threat, suggesting that there are limitations to such tragic events to provoke a shift in attitudes in the long term, especially in the absence of strong immigrants’ rights movements to challenge prejudice and discrimination. These questions will be explored over the next few months in our project as we carry out a survey about how young people use the media to understand global conflict in relation to the refugee crisis, and as we analyse mainstream and alternative media coverage. Will refugees be pitted against EU migrants, or, as some have argued, will it legitimise more resentment towards all foreigners and racialized people? And, like the mobilisation that took place after Alan Kurdi’s death, will social movements to defend immigrants and refugees develop, particularly in the aftermath of a Brexit vote? Updates will be posted here. 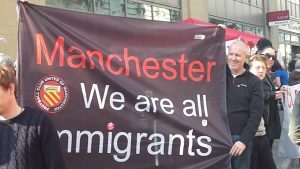 Author Kirsten ForkertPosted on June 23, 2016 June 23, 2016 Leave a comment on Does it take a tragedy to question the normalisation of anti-immigrant rhetoric? Can the public conversation on the refugee crisis be changed? On 25 April 2016 the Commons rejected an amendment to the new Immigration Bill which attempted to force the government to allow 3,000 unaccompanied Syrian child refugees into the UK. The rejection of the amendment tabled by Lord Dubs, a survivor of the Holocaust, produced the unexpected reaction of The Daily Mail, normally hostile to asylum seekers: while reaffirming the lack of legal obligations to do so, the newspaper appealed to give sanctuary to those “lost children”, as a matter of “moral and humanitarian duty”. This reaction was part of a larger public support to the amendment, followed by indignation against its rejection. Humanitarian shifts like this have occurred frequently in the last two years, both in the UK and Italy. Within generally alarming debates on the “refugee crisis”, these shifts seem to suspend securitarian and utilitarian discourses framing mobility and presence of displaced people as a problem at best, and at worst as related to dubious if not criminal activities. This has to do with the prevailing representation, exacerbated by economic crisis and austerity, which presents migration as a threat to national security and welfare, and migrants as ‘taking things’ which are not rightfully theirs (jobs, housing, social benefits, access to public services). As found out recently by the Migration Observatory, the most common word still associated with the word “immigrant” in the UK mainstream print media is the word “illegal”. May such humanitarian shifts in debates offer some hope that, at least momentarily, the public conversation can be changed? As researchers and activists, we are interested in exploring the potentials and limitations of these disruptive moments to develop into larger-scale transformations in public attitudes and policies towards displaced people. Our research project was inspired by a crucial humanitarian shift occurred in the summer of 2015. The summer began in UK with a series of newspaper headlines and speeches calling asylum seekers “swarms”, “floods” and “marauders”, with controversial Sun columnist Katie Hopkins even comparing them to “cockroaches”. At the same time, in the UK, donations of clothing to Calais were organised fairly spontaneously on social media – which seemed at odds with the rhetoric coming from the government and the mainstream press. 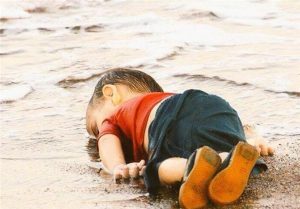 This then changed with the iconic photographs of the Syrian child Alan Kurdi: one of his lifeless body washed up on the shores of a Turkish beach, and another with him being carried away in the arms of a policeman. For a brief moment, the European refugee crisis was framed as a humanitarian crisis (even by the normally hostile tabloid press), and stories about the conflict people had fled and the sacrifices they had made to leave their countries made media headlines. The solidarity demonstrations and sit-ins that we had attended as activists, the Facebook groups and the social initiatives welcoming refugees grew larger after this emotional turning point. Attitudes have hardened again since that summer of 2015. The terrorist attacks in Paris and Brussels have taken place since then, as well as the sexual assaults in Cologne. All have been blamed on immigrants and refugees to a certain extent, despite evidence showing that all of the named suspects in the Brussels attacks and the Paris attacks were European citizens, and that only 3 out of the 58 suspects in the Cologne sexual assaults were refugees. This has also fuelled an increasingly hegemonic “clash of civilisations” narrative from some commentators about immigration, especially from Islamic countries, as a threat to European liberal democracy, in order to push states to reinforce border controls. Taking a closer look, humanitarian and securitarian concerns may be seen as deeply imbricated rather than as alternative narratives. This imbrication was evident in particular in the Italian debates on migrant deaths at sea. On one side, shipwrecks such as that occurred on 3 October 2013 half a mile from the island of Lampedusa, when 366 people lost their lives in the deadliest tragedy ever occurred in the Mediterranean after World War II, produced an unprecedented sensation throughout Europe. 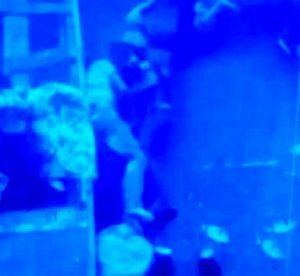 Everybody was moved by the pictures taken by scuba divers of two dead bodies locked in an embrace at the bottom of the sea. This highly emotional context pushed the Italian government to launch a major search and rescue mission in the Mediterranean, called Mare Nostrum, which ran for a year before government ministers across Europe, including the UK, expressed concerns that it encouraged people to make dangerous crossings in the expectation of rescue. On the other hand, the humanitarian approach constructs people as victims to be rescued and presents deaths at sea as simultaneously sensational and almost natural events. It legitimises the militarisation and the externalisation of border controls in order to prevent new fatal incidents. This means that causes of people displacement are not publicly discussed, including war and armed violence; the role of restrictive EU migration and asylum policies in causing deaths at sea are also left out of public debate, as traffickers alone are blamed. The humanitarian approach reduces migrants to shipwrecked persons. But what happens to people after being rescued by these military-humanitarian actors? Issues they face as they try to make a life in a new country attract less media attention, including violations of right to asylum, poor accommodation, social marginalisation, labour exploitation or loss of legal status. Refugees are thus constructed as vulnerable bodies naturally exposed to the risk of death, yet generously rescued by governmental action. Does this everyday exposure to images of rescued people familiarise the public with distress image which naturalises the death of “the others”, suspends solidarity and prevents indignation and critical insights? Finally, the handling of the refugee crisis by European governments and institutions (caught between humanitarian concerns and pressures from anti-immigrant and right populist groups) becomes seen as representative of a failure of governance: failure to control borders, to offer humanitarian aid, to respond effectively to global conflicts such as civil war in Syria and instability in Libya. The refugee crisis will therefore be apprehended as a crisis of the European border regime and, more generally, of the EU as a political project based among others on internal freedom of movement and solidarity between member states. Decisions of some Central-Eastern European governments to build fences on their borders and ask for suspension of the Schengen Agreement came in tension with more welcoming yet selective attitudes displayed by countries like Germany and with the efforts made by countries like Greece and Italy to manage new arrivals. Many countries, including UK and Italy, have experienced mistrust towards national, European and international institutions, connected to concerns about political corruption, economic crisis and border controls. This is currently playing out in the UK in the referendum on membership of the European Union, which in many ways a referendum on immigration. Our research project tries to disentangle these complex developments through exploring in particular how people in the UK and Italy make sense of global conflicts and of their nexus with contemporary migrations towards Europe, and how this understanding shapes attitudes to those displaced by war and armed violence, and to public authorities dealing with these issues. We are interested in looking at how the different dimensions of the refugee crisis highlighted above are covered in the mainstream media, but also in mapping initiatives set up by citizens (such as the donations of clothing mentioned earlier) which reflects the depth of solidarity-based impulses towards the victims of war and violence. The perspectives and experiences of refugees themselves are crucial to our project as those voices are generally silenced or under-represented in the mainstream debate. For instance, research carried out by Migrant Voice campaign organisation on media coverage of immigration in UK showed that only 12% quoted a migrant. Through carrying out interviews and memory workshops, we hope to find out what these perspectives and experiences have to offer in understanding conflict and imagining the future of Euro-Mediterranean societies. Author Kirsten ForkertPosted on June 1, 2016 June 1, 2016 Format Chat1 Comment on Can the public conversation on the refugee crisis be changed? The project will explore how people in the UK and Italy make sense of international conflict and how this understanding shapes attitudes to those displaced by conflict. We are interested in analysing the representation of conflict and of the impact of conflict through media representations, official and popular discourses, and institutional and citizen initiatives. The creation of an online exhibition and theatrical script created in collaboration with people displaced by conflict. Both the UK and Italy have experienced mistrust towards national, European and international institutions, connected to concerns about corruption, economic ineptitude and border controls. Far right populist groups and anti-immigration politicians have tried to exploit the situation by blaming immigrants and refugees for a whole host of social and economic problems. But at the same time there have been many examples of solidarity, including those who have called on their governments to take more refugees and their cities to offer sanctuary, offered up their homes and donated clothing. Much of this has been organised on social media and reflects the depth of humanitarian impulses towards the victims of war and conflict. The project will explore how European populations understand questions of international responsibility in a time of global conflict that is displacing millions of people. Finally, we’ll explore how refugees themselves – many of who have fled conflict and destitution – remember and memorialise the situations they have left behind. How can they help us understand the refugee crisis, and more generally international conflicts? We will be posting updates of the project as it develops. Does it take a tragedy to question the normalisation of anti-immigrant rhetoric? 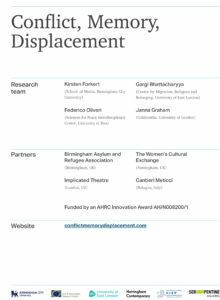 – Conflict Memory Displacement on Can the public conversation on the refugee crisis be changed?